This amazing resource provides everyone (even those not familiar with colour theory) with the means to explore the different types of colour, experiment with how colours blend together and work out colour schemes based on easily followed guidelines. 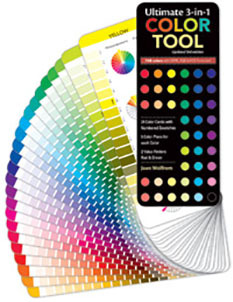 The ColourTool includes 10 instruction cards, 24 two-sided colour cards with one side having the colours shown through different colour plans and the other side having colour codes. In all 816 colours are illustrated, with CMYK and RGB and HEX formulas, and 2 Value Finders Red & Green. The 24 colour segments are the basis on which our own 12 Colour Groups are structured so using this Colour Tool can help make the right choice of yarn colour from our extensive range. This chart shows how weaversbazaar dyed wools map to the colour tool and this article from our Library suggests ways in which the Colour Tool can be used.